WAVES – Work on It Until We Love It! Artist Cindy Fletcher Holden had a predicament: the painter/muralist needed a large space for a weekend art exhibit. It was 2002, and she was eyeing the McNasby Oyster Company building, which the Annapolis Maritime Museum had recently leased from the City of Annapolis. Holden could use the Eastport building on two conditions. First, she would be responsible for clearing and cleaning the space. “It was still a 100-year-old oyster house that smelled like a 100-year-old oyster house, and it was filled, from floor to ceiling, with stuff,” Holden recalls, laughing. Second, the show must have something maritime—not a focus of the artists’ works—associated with it. While pondering this problem, Holden, working on a mural in Galesville, spilled some paint. “It was oozing into the cracks in the sidewalk, which I thought was really pretty,” she says. A brainstorm ensued, and “art between the cracks” morphed into Art Between the Creeks (ABTC)— an apt name for an exhibition of artists living around greater Annapolis. Preparing the space was a formidable task. Holden recruited some nearby boatyard workers to clear out heavy items, and she and her fellow artists gave considerable time and muscle as they cleaned and painted, transforming the space. The exhibit was successful, and ABTC took off, surprising Holden as it evolved into a well-known biannual weekend event. 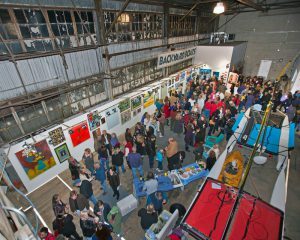 Each June and November, hundreds come to ABTC’s Friday night opening party at its current home in the Backyard Boats building at 222 Severn Avenue to see the latest works from not-often-seen artists. The project lay dormant for nearly a decade, until Holden gathered some artist friends who didn’t know whether or where to show their work. One such artist, Michael Matthews, created beautiful wrapping paper with inks and mixed media and then threw it away after use. Holden’s reaction was, “Get it on a wall!” And with Coxe’s concept in her head, she sprang into action. After Hurricane Isabel severely damaged the McNasby building, ABTC found space in the Annapolis Yacht Club’s storage building. But it had an abundance of shelving, and its walls and shelves could not be drilled into. Artist Channing Houston devised a plan: the artists wire-tied 1×4-inch boards to the shelving and then attached 4×8-foot sheets of plywood that they’d painted white. After hiring an electrician to install plugs, they hung and positioned bucket lights, and the transformation was complete. “When we were done, it was shocking how beautiful the space looked. It looked like a New York gallery,” Holden says. 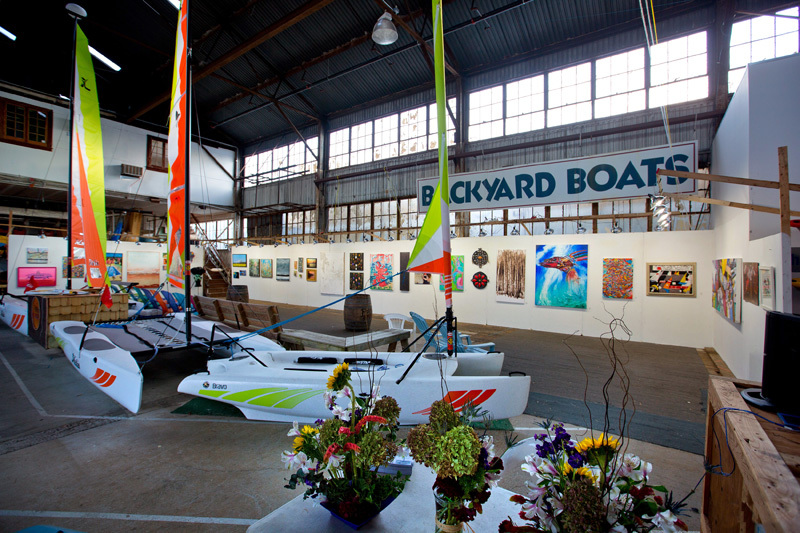 Over time, Annapolis Yacht Club needed more of its space, and ABTC was welcomed at Backyard Boats, housed in the historic Trumpy Yacht Yard building. There, the artists again engineered a complete gallery without modifying the walls. Says Holden, “The other spaces felt like an art galley first, with remnants of other uses. But in this space, we don’t create a room, we only create a wall inside this old, wooden warehouse. The boats are there, and they create a character.” Audience crossover occurs during the exhibition, as art lovers see the boats for sale and boat clients view the art. Holden finds new ABTC artists unconventionally. Once, while in Eastport Liquors, she struck up a conversation with an employee; his artwork is now in the show. She seeks artists of all ages, with a variety of styles, “from conservative to off-the-wall, scratch-your-head,” she explains. A few months before each show, Holden convenes the artists. They share what they are doing with their art, discuss business, and name the show—but there is no obligation for the artists to respond to the name. “I can’t bring myself to dictate to them what to do,” she says. “The only thing I request is that the art be new.” This provides motivation and a deadline. Over the years, Holden has seen artists become more experimental, supportively push each other, and create friendships. The week leading up to the show runs like clockwork. On Monday, the walls go up—they now take 90 minutes to assemble and 60 minutes to take down—and on Tuesday, lights are installed and positioned. Wednesday is “hanging night,” when artist Leonard Koscianski curates the exhibit: artists arrive with all potential entries at 5 p.m., and by 7 p.m. pieces are selected and their placement decided. The show starts late Friday morning and concludes on Sunday afternoon. By Monday morning, business at Boatyard Boats resumes, “like in Cinderella, back to the pumpkin,” smiles Holden. ABTC is self-sufficient, neither relying on grants nor turning a profit but thriving by other standards. Artists pay a modest entry fee, and a stunningly low percent commission is taken for sales. Backyard Boats provides the space gratis. For the Friday night party, Boatyard Bar & Grill donates toward liquor and incidentals, the artists bring finger food, and Box of Rain provides onsite bartenders. Drinks are free, and the tip jar is usually full. “[There’s] nothing drippy, nothing red, nothing stainy,” says Holden, mindful of the space, boats, and art. Error: Error validating access token: Session has expired on Saturday, 09-Mar-19 15:57:50 PST. The current time is Tuesday, 23-Apr-19 08:50:34 PDT.